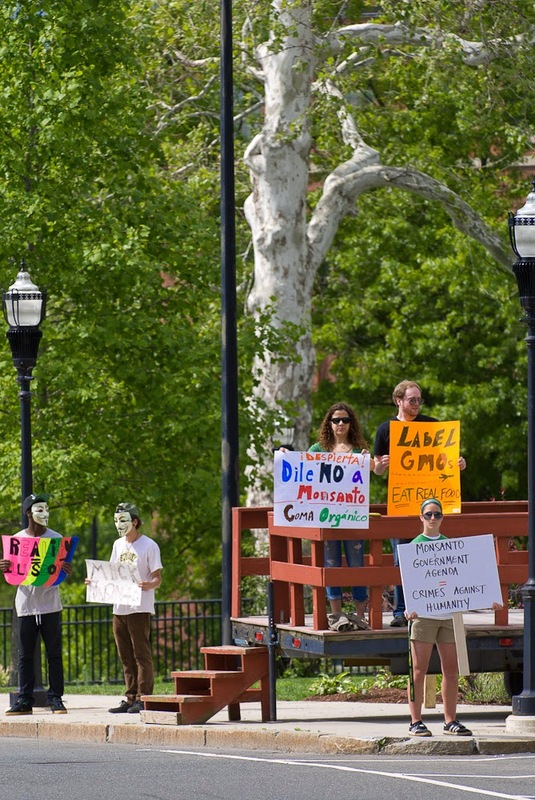 On this international day of protest against the Monsanto corporation's production of Genetically Modified Organisms (GMOs) and chemical farming products, activists gathered in front of Chicopee (Mass.) City Hall to voice their opposition to Monsanto. 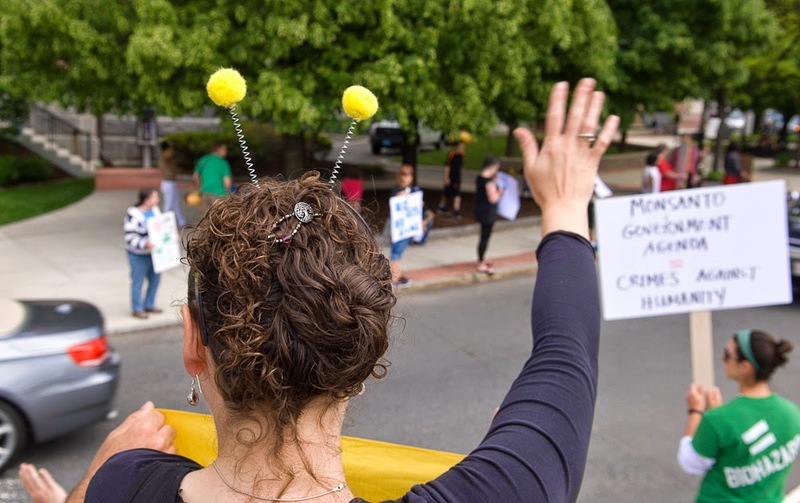 The protestors claim that Monsanto products release neonicontinoids and other chemicals into the environment that are reportedly toxic to bees. Across the street from the event stand the Cabotville Sycamores (one shown here, big white trunk). During their close to 200 year tenure, they have seen a canal dug, a rail line laid, a city developed and industrial factories built. Swords for Lincoln's troops, doors for the Capital in Washington, D.C. and Spaulding basketballs have all been made here in the Ames complex, the brick of which you can glimpse through the trees. Patricia Sanchez lives in the former mill complex, now converted to apartments. She holds the sign written in Spanish that reads in English "Wake up! Say No to Monsanto. Eat Organic." "Just as trees remove carbon from the atmosphere and hold it for many years in their woody tissue, so do they sequester the shared experiences of the people who live alongside them. The growth rings of trees contain, in organized fashion, physical manifestations of the world and of the human presence in it at different times in a tree’s history." Several families came to protest. Here, Kayden Beaulieu holds a Caique Parrot (the pet of another protestor) as her grandmother Nina Renshaw looks on. 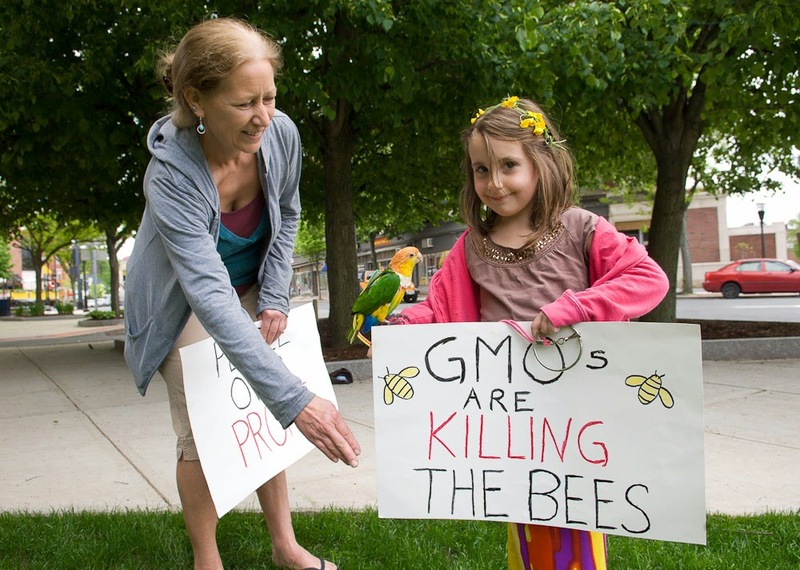 Later, young Kayden walked to her car chanting, "Hey Hey Ho Ho, GMOs Have Got to Go", evidence that she had done some sequestering of her own during the event. 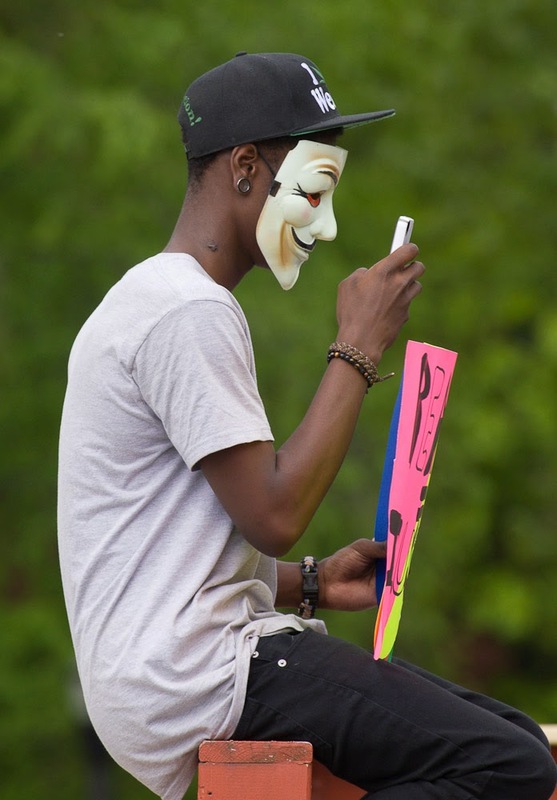 Jessiem, sporting a sign emblazoned with "Reality = Illusion", took a moment to commune with his smart phone. I asked him about the mask. "The government is hiding stuff from us, why not hide our identity?" The group was mixed, likely brought together by a Facebook event. 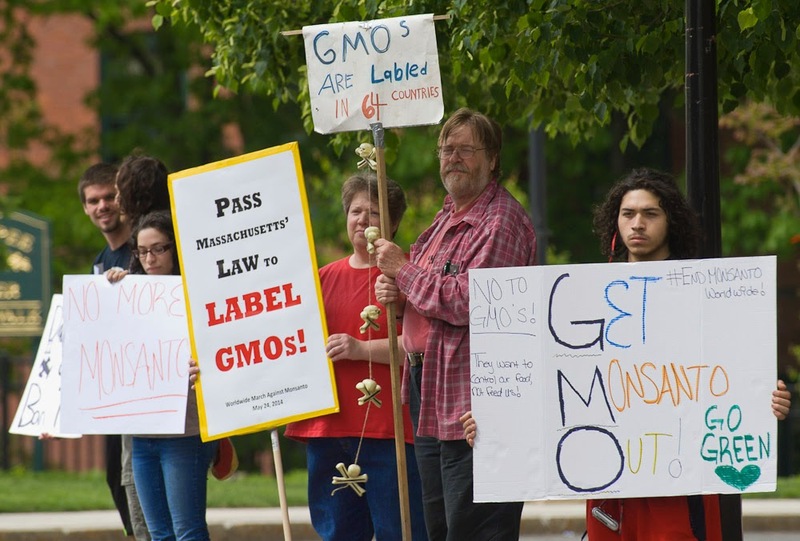 While the Massachusetts legislature is contemplating passing a GMO labeling law, one protestor's sign read: "Don't label GMOs. Ban Them!" 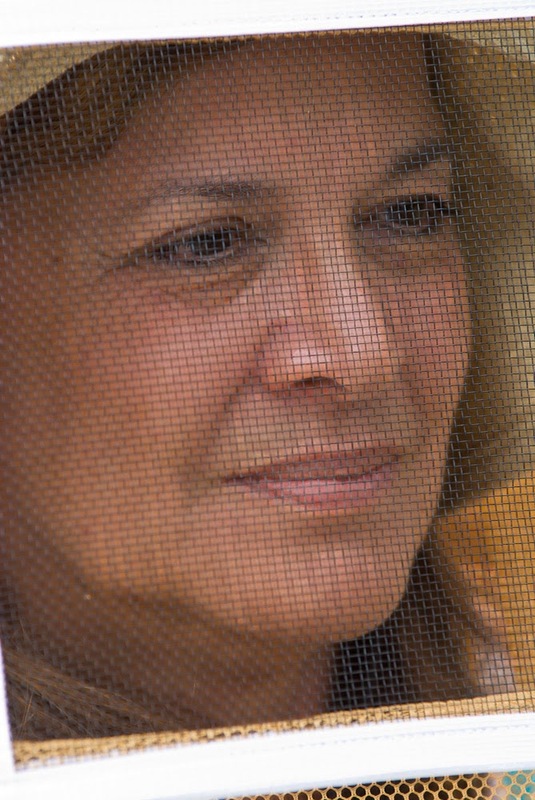 Beekeeper says, "Monsanto is a Buzz Kill"
Linda Buckburn's bees have not been affected by Colony Collapse Disorder that some attribute to pesticides, but she advocates natural rather than chemical farming methods. A plaque near the Cabotville Sycamores states, "The sycamores have survived hurricanes, floods, an industrial revolution and the onslaught of modern urbanization." The protestors prod us to wonder if the venerable trees can survive the environmental impact of modern farming methods. The notion alone of "if these trees could talk" gets the creative juices going. I love looking at trees as well as drawing them. I was in your cultivating creativity class and was looking through my sketchbook from my last semester and stumbled across the url to this site. I hope to see more updates from your adventures professor!